I've found a printer for Wall Scrolls, which is something I wanted as a reward on this project for awhile now. I updated the main page with mock-ups and dimensions of the wall scrolls, include a huge 32"x48" wall scroll size. For the regular size (16"x48") all 5 character sprites are available as they are in 100% resolution. For the deluxe size, you have Queen Llend, mother of Mercilia. Currently I am also planning two other special wall scrolls. One will be the same image used on the limited edition cover of the game, and is not available in any other reward. 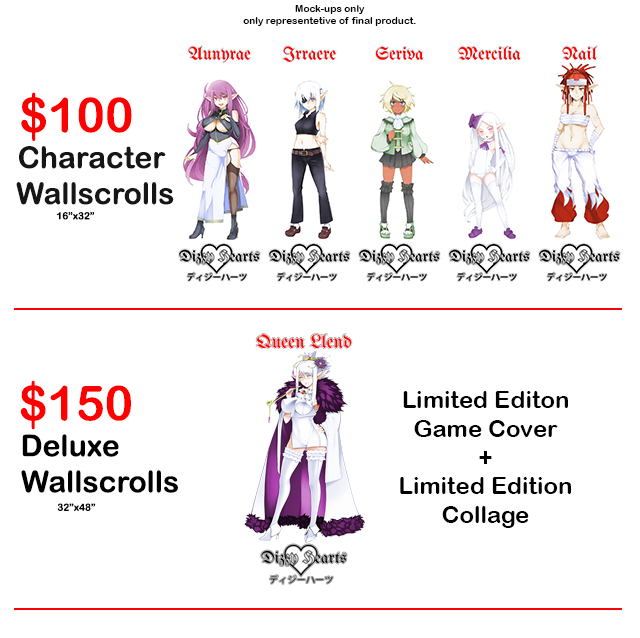 Another is a uniquely created character collage the characters of Dizzy Hearts, minus Seriva only available as a deluxe wall scroll. Mock-ups of those are still pending. In addition to that I've been finding a printer for the game boxes and the CDs for both the normal and FLAC soundtracks. Details to come later!